To avoid a whopping case of buyer’s remorse, there’s no better place to turn for advice than the ranks of fishing pros. 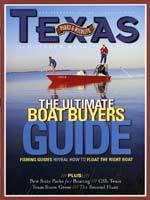 There are, unfortunately, a lot of $35,000 mistakes floating about on Texas bays and lakes. No one can afford that kind of error. Yet it happens all too often, usually to awestruck consumers who allow their impulses to outweigh their sense of judgment. The first step an angler might take when seriously considering a boat purchase is to chill out, let the information rest for a day or two and then honestly assess the advantages and drawbacks of the fishing rig at hand. While he’s at it, he might also do well to seek sound advice from the people who arguably have more at stake than anyone else when they finally drop the cash on a brand-new rig. He might, for the safest of assurances, consult his local fishing guide. Professional guides fish for a living because they love to fish. If any of them have become fabulously wealthy while running a guide service, or even modestly so, they’re being mighty tight-lipped about it. Guiding is not a profession for those adverse to risk. There are far too many variables — everything from fickle seasonal weather to yo-yoing fuel prices to constantly changing regulations — to assure even the best of anglers that fishing for hire is a safe and secure profession. Almost everything a guide encounters during a day on the water is prone to change, be it the clarity of the water, the level of the tide, the velocity of the wind or even the type and experience of the fisherman he’s hosting. Perhaps the only thing a professional fisherman can truly control is the choice of fishing boat. No wonder, then, those professional guides dedicate a tremendous amount of research and soul-searching to the critical process of selecting a boat. No cowboy on the range ever gave more thought to choosing his horse. Because, in the end, it all comes down to leaving a protected place, striking out in the open and making it back — be it to the corral or the boat dock — safe and sound. A guide’s boat matches the waters at hand, the fish that reside in those waters, the people who pay for the trips, and as much as anything, the professional who provides them. When your livelihood depends on it, you tend to make wise choices. It’s tough enough attempting to make a living as a fishing guide. From the wrong boat, it’s virtually impossible. So, in the pages that follow, we’ve asked a cross-section of Texas fishing guides to profile their rigs and the various reasons they chose them. It’s important to remember, however, that literally hundreds of fishing guides run just as many fishing boats in Texas waters. For every guide we cover here, there are a great many others who have chosen just as well. There is, unfortunately, no fast and simple way to determine the “best” boat for a given buyer. Still, considering that the average fishing guide puts more running time on a boat in a year than the typical fisherman does in a decade, it’s not a bad idea to hear what these pros and others have to say about the most important decision most anglers will ever make. At 3,100 acres, Coleto Creek Reservoir near Victoria is by no means a “big” lake when compared to the average Texas impoundment. It is, nonetheless, home to veteran bass guide Joe Lancaster when he’s not chasing the tournament trail on the sprawling waters of much larger reservoirs like Sam Rayburn, Toledo Bend and Amistad. Lancaster was drawn to the Nitro’s oversized casting deck, abundant storage space and performance in general. “I spend long, long hours in that boat,” he explains, “so a smooth, dry ride is critical. Even on a small body of water like Coleto Creek, whether you’re fishing a tournament or guiding a party of fishermen, you’re still out on the water all day long. “Little things like a power pedestal seat, a trolling motor pedal recess, illuminated and organized rod lockers and anti-slosh live wells with pump-out features really make a difference when you’re working inside a boat from sunrise to sunset. Pontoon boats will never win acclaim for their snazzy appearance or blazing speed. Then again, neither really counts when it’s time for veteran Toledo Bend Reservoir fishing guide Jim Morris to put his parties on limits of crappie. Morris owns and operates Cypress Creek Marina near Mill Creek. He regularly fishes the waters from the dam north to Hausen Bay, near Indian Mounds and Six-Mile Bay. And when the lake’s resident “white perch” congregate en masse during the winter, near the legendary channel drop-offs of the “Chicken Coop” north of Pendleton, he further extends his reach by putting the large but lightweight boat on a trailer and towing it to the action. So, he adds, are the fishing applications of his boat. “Pontoon boats are as practical as it gets for this kind of fishing,” Morris explains. “Everyone has his own seat, and it’s comfortable. And,” he adds, “you have room to move around. The high sides protect the kids, and there’s plenty of storage space. “I looked at most every pontoon boat around, and really liked the aluminum framing of the Starcraft,” he notes. “It sits high in the water, and even with an extra-heavy load, remains extremely stable … another aspect families really appreciate. It also handles rough water surprisingly well. “This is a huge lake,” Morris cautions, “and it can get extremely rough. But my boat is rigged with a 50-horsepower Mercury outboard, and that’s all the power I need. I burn no more than 10 gallons of gas in a full-day trip, so it’s very cost-efficient. Striped bass are big, strong fish that roam for miles at a time while hunting down their quarry. It only makes sense that longtime Hill Country striped bass specialists like guide Ken Milam are prone to use boats that fit the same basic description. Milan is a specialist who has made an art form out of live-baiting the powerful saltwater transplants. In order to handle up to five fishermen and twice as many baited rods on the expansive and unpredictable waters of scenic Lake Buchanan, Milam chose a spacious, 23-foot Kenner 230V. For his unique purposes, the sizable saltwater-style vee-hull is literally made-to-order. “Like every other guide, I need all the room I can get,” Milam says. “You have options when ordering, so I had Tracker Marine change out the standard 230V console and put in the smaller center console from their 18V. I’m not worried about the size of the console,” he explains. “It’s all about the room. On the Lower Laguna Madre an angler typically encounters two types of water: shallow, and very shallow. The hull of Capt. Skipper Ray’s Curlew weighs a mere 695 pounds and drafts a scant 5 inches of water. With that in mind he runs a 90-horsepower Evinrude E-Tek outboard that, at 4,200 rpm and 29 mph, grants him a generous five miles per gallon. “Poling” is a technique born on the Florida flats, endemic to low-profile, lightweight hulls that minimize wind drift as much as possible. It’s also an essential drill for serious flats fishers. The elevated poling platform on the stern of Ray’s Curlew grants the guide both elevation and leverage when the time comes to break out the push pole. On deep-water venues and deep-draft hulls, a poling platform amounts to little more than show biz. On shallow lagoons, however, it often means the difference between fish and frustration. From San Luis Pass all the way up to the Anahuac National Wildlife Refuge, the Galveston Bay Complex comprises a huge and potentially volatile fishing frontier. Capt. James “Frenchie” French has navigated the bay in the best and worst of conditions, but it’s the latter that drove him to choose his 22-foot Skeeter bay rig. Over 50 years ago, Kilgore-based Skeeter pioneered the design of freshwater bass boats. The company’s saltwater hulls are a distinct reflection of that technology. The payoff is more than apparent in the live well design. In terms of diversity, no place in (and, in this case, almost nowhere outside of) Texas compares with the uppermost reaches of the coastline on the Louisiana border. Capt. Bill Watkins faced a daunting task when selecting an all-around rig for the radically different environs of the Sabine Lake area. He ultimately chose a 21-foot Maverick Master Angler with a 200-horsepower HPDI Yamaha outboard. Rough water poses a constant threat on the saltwater “lake” and, of course, the nearshore Gulf of Mexico. For greater on-plane control, especially with varying loads, and to maximize fuel efficiency for such long trips, Watkins relies heavily on both trim tabs and a hydraulic jack plate. His Maverick sports a “walk-around” deck design that, although recessed inside, allows anglers to maneuver fore and aft around the console without stepping down. That maneuverability is essential, especially when battling large game fish in crowded quarters. Twenty miles offshore, with a 50-pound cobia coming to gaff, that’s an understatement at best. It’s by no means a purebred “offshore” hull, but the mere fact that Watkins and parties regularly venture out into the Gulf speaks volumes for the durability and versatility of modern fishing hulls like his 21-foot Maverick. If there is a common contention here, it’s that all of the aforementioned pros bought the largest boats possible. It’s generally false economy to buy less boat than you want, even if it means waiting a while to get it. Almost invariably you’ll end up selling the smaller rig and upgrading to the larger hull you initially wanted. Consider the substantial depreciation of a new boat as soon as it leaves the dealership, and the overall cost difference between the two rigs may not turn out to be as insurmountable as it seems. Certainly it’s no fun to wait. Buyers who are in a hurry typically go straight to the option of a longer financing period. Be forewarned: A few minutes with a pocket calculator can quickly dispel the notion of “economy” on a long-term note. Suffice it to say that it’s nigh impossible to find a boater who regrets having avoided an impulse buy. So, if cash is burning a hole in the proverbial pocket, use it instead to book a day on the water with a reputable guide who fishes where you do, the way you do — and, with the boat-motor combination you think you want. For the cost of an average boat payment, you’ll quite possibly avoid a mistake that could cost you a great deal more for many years to come. Whether on a lagoon or lake, boating accessories are essential to fishing success. Electronics rank foremost, specifically depth finders and trolling motors. Interestingly, the two are often combined. Combination depth finder/GPS units have grown immensely popular in recent years. Fishermen can pinpoint productive spots with the push of a button and return, precisely, to those same spots time and again. Modern consoles sport a collection of useful gauges that range far beyond the customary fuel and speed indicators. Some manufacturers offer fuel efficiency gauges that, in amazingly precise fashion, calculate fuel usage and travel range. Surface water temperature gauges, once the exclusive domain of largemouth bass specialists, are now also common on bay fishing rigs. Accessories abound for modern fishing craft. For every style of angling there is a host of helpful add-ons that greatly enhance the sport. A boat show tour will reveal it all, from hydraulic jack plates that lift and lower outboard engines to glued-on keel protectors that shield a boat’s hull from the ravages of concrete boat ramps and shallow-water obstructions. Despite ready access to cell phones, safety-conscious fishermen own VHF radios for on-the-water communications and weather reports. Cell phone zones vary, and batteries may lose power, but a waterproof VHF is a constant and reliable open-water companion. Every fishing scenario presents its own unique set of challenges. Scan the pages of marine catalogs, or stroll the aisles of the aforementioned shows, and you’ll discover an engineered solution to virtually every potential problem. Like the boats they are designed to augment, there are enough accessory choices on the market to intimidate even the most knowledgeable of boat buyers. It’s yet another reason why those looking for guidance in making educated buys might first turn to a guide for educated advice.